TV out from your Arduino. 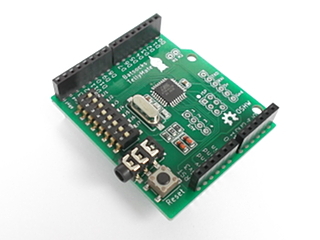 This shield has the same core circuit as the standard TellyMate, but re-arranged as an Arduino Shield. 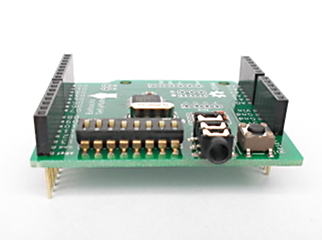 It listens to the Arduino's TX pin (Digital pin 1). Just plug it into your Arduino and use Serial.println() commands to output text onto your telly! Further demonstrations (including screenshots), are available from the 'examples' page. The TellyMate Shield is stackable. Care has been taken to ensure that no components extend beyond the female headers on the top of the board, meaning that other shields can be connected above. In particular, the bulky phono socket on the original circuit has been replaced by a 3.5mm jack socket (a suitable cable is included). 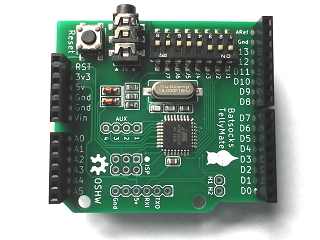 An extension reset button is provided to duplicate the (covered) reset button on the underlying Arduino. Up to 11 fontbanks can be uploaded (to flash) for use. The original 'jumpers' based configuration of the TellyMate Shield has been replaced by a set of DIL switches. These switches control the serial baud rate, output format etc. See the 'Jumpers' page of the User Guide for more details. The default character set is Code Page 437. It provides the basic alphanumeric characters as well as simple graphics capabilities. Sending normal text using a Serial.println() command (or similar) will simply print the string onto the TV's screen, but there are certain control sequences that allow you to have more flexibility such as moving the cursor, selecting graphics characters, turning off/on the output etc. The underlying schematic and source code for the TellyMate Shield is identical to the original TellyMate. The Source Material for the TellyMate is released under a simple FreeBSD-style licence. See the code in the 'Files' section of the original TellyMate for details. 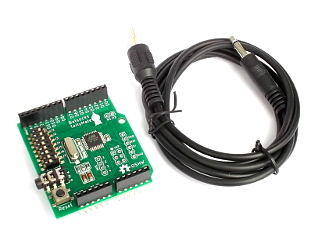 The TellyMate Shield is supplied all ready to plug into your Arduino development system. No soldering is neccesary. Please contact us for our volume pricing / availability (10+ units).